Boris Johnson – during his trip to India to promote London – set out his vision to build an “aerotropolis” around a new terminal for his fantasy project of a Thames Estuary airport. He said a town of about 20,000 people could spring up to the east of London based around a 4-runway hub airport (it was 5 runways last week…). It would have four or five “anchor” developments such as a hospital, university campus, a major business or exhibition centre to create thousands of jobs. A social infrastructure including homes, schools, shops, parks and a transport network would be a key part of the plan. Any such scheme would have truly dreadful environmental and biodiversity impacts. The Mayor said London had “much to learn” from India on the future of airports. He added that he was “inspired” by his visit to Hyderabad’s two runway airport — a leading example of an “aerotropolis” that is set to double in size over the next five years (that is because India is only starting to develop its aviation, while we did so decades ago, and it has a massively larger population). Boris Johnson today set out his vision to build an “aerotropolis” around a new terminal in the Thames Estuary. A town of about 20,000 people could spring up to the east of London based around a four-runway hub airport. It would have four or five “anchor” developments such as a hospital, university campus, a major business or exhibition centre to create thousands of jobs. A social infrastructure including homes, schools, shops, parks and a transport network would be a key part of the plan. The Mayor said London had “much to learn” from India on the future of airports. He added that he was “inspired” by his visit to Hyderabad’s two runway airport — a leading example of an “aerotropolis” that is set to double in size over the next five years — on his week-long tour of the country. The scheme is the idea of American urban design expert Professor John Kasada, who advised the Hyderabad project and is expected to be invited to London by the Mayor to help his submission to the Davies commission on aviation. Stepping onto the tarmac, Mr Johnson said: “This airport in Hyderabad is very impressive. The Indians are very ambitious but they are very efficient as they use the airport to grow the local economy. They are quite right. We have much to learn.” Later, in a meeting with Indian infrastructure ministers, he said: “I very much admire that vision and I’m thinking along similar lines in London. Mr Johnson received a briefing from airport boss Kiran Kumar Grandhi, who also built the new hi-tech hub airports at Delhi and Istanbul in record time. A private health clinic — offering fly-in, fly-out operations — a Canadian business school campus, exhibition and convention centre and maintenance business are already under way on the 1.2 million square foot site, which serves a city of seven million. Mr Johnson also picked up tips on funding the project — the Mayor has said his Thames Estuary idea could be funded entirely by the private sector. But Hyderabad airport, which was built in 31 months and serves 12 million passengers a year, was funded 30 per cent by equity, 40 per cent by debt, (four fifths of which was domestic and the rest from Gulf states) and the remainder from government and state grants. Mr Johnson’s “aerotropolis” plan is certain to meet criticism from green campaigners opposed to aviation expansion, residents in the Estuary and bird protection groups. London Mayor Boris Johnson has revealed plans to create an “Aerotropolis” in the Thames estuary if his controversial new airport is built. The proposal would see Boris Island developed as a new city as well as a new airport. The Mayor’s plans were revealed on a visit to the Indian city of Hyderabad where the airport boasts a business school, hospital and exhibition centre. 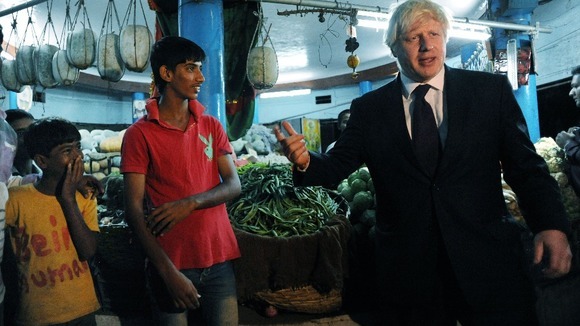 It comes as Mr Johnson said the UK had “much to learn” from India when it came to building airports, as he arrived in the city for talks with senior officials. The London Mayor also met executives from GMR for a 15-minute presentation on the airport the Bangalore-based group built in the city, widely regarded as India’s new silicon valley. Aides said he found the meeting “informative and illuminating”. Mr Johnson, a vocal opponent of the Heathrow expansion, has argued for a new four lane runway to the east of London, in the face of opposition from some in Government who have argued for a third runway to be built at what is already the country’s largest airport. Significantly, GMR has recently built a new airport outside Istanbul in Turkey, as well as a hub at Delhi. As part of efforts to cement contacts in Hyderabad, Mr Johnson will meet officials from the office of the city’s state governor. He will then head to the Indian Business School – one of the top 20 in the world – to give a speech aimed at encouraging investment in the UK. Hyderabad is regarded as India’s most up-and-coming city outside of Mumbai and Delhi, specialising in the high-tech industries, and Mr Johnson is keen for its firms to establish their European base in London and bring many highly-skilled jobs. Afterwards, the mayor will head to Mumbai, where he will hold a reception at the British High Commission with England’s victorious cricket team. The event will also be attended by Indian business leaders.